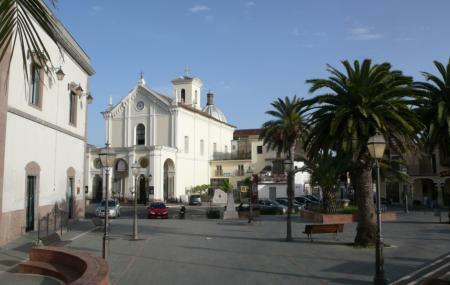 Find hotel near Cristo Maestro - Castel V ..
Cristo Maestro - Castel Volturno is a church and an outdoor public venue. Open only during summers, this venue has well-manicured lawns and canopies. Want to plan a DIY trip? Use Castel Volturno trip planner for the same. You can enjoy a comfortable stay in the city by booking the best hotels in Castel Volturno like Hotel Suisse, Hotel Exagon and Hotel Joy. If you want to add the visit to Cristo Maestro - Castel Volturno in your trip, you can choose from the variety of Castel Volturno vacation packages that can be designed to suit your preferences. These packages also cover your major concern of how to reach Castel Volturno. Love this? Explore the entire list of places to visit in Castel Volturno before you plan your trip. Fancy a good night's sleep after a tiring day? Check out where to stay in Castel Volturno and book an accommodation of your choice. Luogo di culto cattolico all'aperto. Si celebra la Santa Messa nelle domeniche del mese di luglio e di agosto alle 18.00; nel resto dell'anno si celebra di sabato in Via Giorgio Vasari 52 alle 18.00 durante il periodo dell'ora legale e alle 17.00 per l'ora solare. Sono luoghi della parrocchia San Castrese in Castel Volturno.